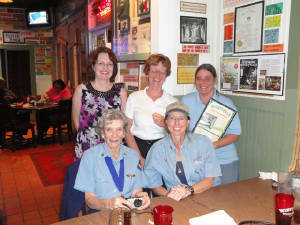 JANUARY 2011: Low ceilings and the threat of icing did not stop Wild Mama and crew from her January mission: Adopt-a-Racer Pilot Program in Mobile, AL. The air was crisp and cool as we departed LaBelle. 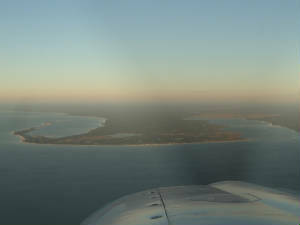 A thin haze blanketed the area so we called for our clearance prior to takeoff. Within a few hundred feet we were climbing out through the soup and into the night. We broke out at 3500' to a clear moonlit sky and a smooth ride. All looked good for the trip to Mobile. We were concerned about the cold and clouds. The weather briefing forecast clouds through southern and northern FL but clearing at about the time the freezing level dropped to the ground. It might be close so we brought an extra flashlight to keep an eye on wing icing. As we leveled off at 4000' we noted the time to destination: 3:00. That looked pretty good considering we were forecast to have headwinds all the way. We were skimming the cloud tops just south of Lakeland, still a smooth ride. We looked at the time to destination: 3:05. The winds had already picked up to 55kts. Ugh! The sun was creeping up over the haze while the city lights below shone up through the thin clouds creating an unusual light pattern. At least we were on top of it for now and did not have to worry about the ice. We watched the temperature drop to 32 degrees as we slipped between the low haze and the upper layer of clouds south of Cross City. We were happy to be below the cloud layer and finished with the possibilities for ice. By the time we broke the coast line all remnants of clouds were gone, the sun was clearly over the horizon and the temperature remained low. Everything being relative, we were happy to see only 30 kts of headwind and 125 kts over the ground. At least we are remaining in triple digits. The radio was quiet. I guess the winds were scaring small planes out of the sky which is a shame because the day was very beautiful ... Just a bit windy and cold, but we maintained a smooth ride approaching Panama City. The emerald green coast glistened off our left wing. The wind and action of the sea had created an interesting wavy patter in the sands along the shoreline. The wind had shifted enough now to a cross wind that allowed us to complete our journey into Mobile at just under 140 kts and just over 3:30. We were met at the airport by Linda Wehrle from the Mobile Visitors and Convention Bureau, who tracked us on Flight Aware and with SPOT. Linda is not yet a pilot but her birthday and Christmas presents were flight lessons and she promises me that she will have a couple lessons under her belt by our next visit. She was our chauffer to get us to the Mobile Boys and Girls club with a brief enroute stop for coffee and breakfast. We arrived at the Club in time to chat with the program director, Inger Anderson. She showed us the handouts that she had printed for the girls and gave us the run down for the day’s itinerary with the idea of mixing and matching activities to keep everyone’s interest throughout the day. The remainder of the guest speakers and assistants began to arrive: Ingred Sorenson, a local Citation pilot and schooner, Joshua, crewmate; new race team Linda Keller and Mimi Reiheld (this is the Mobile “local” team. 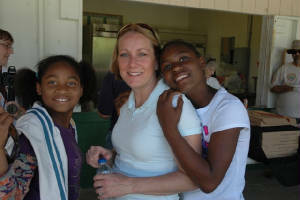 Mimi now lives in NC but is a transplant from Mobile); Vern (the token male), Linda, Ledonna and a few other ladies from the Boys and Girls Club. The girls filled out intake questioners that included questions like “Have you even been on an airplane?” Less than one quarter of the girls had been on a plane and barely half had been to an airport. 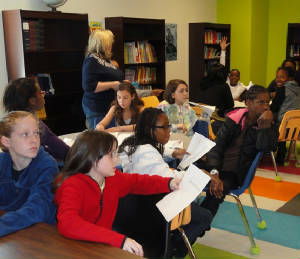 After brief introductions, the 45 girls plus guests saw the first part of Breaking Through the Clouds. Intermission started with a question and answer session where the girls earned coupons for correct answers. They knew the number of racers in the original race, why it was called “Powder Puff Derby” and the year being 1929. The intermission activity was paper airplanes. 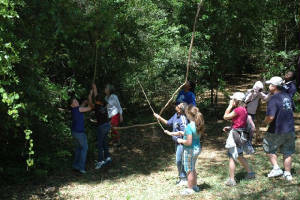 The girls divided into groups of 5 and an adult was assigned to each group. 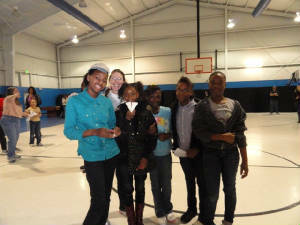 Each girl made a paper airplane and test flew it in the gymnasium. 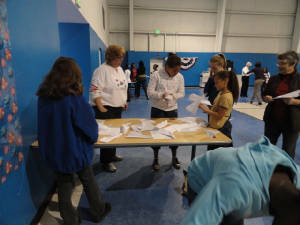 Adults helped with the folding and making ailerons to help the planes fly a little better. Then once all the test flights were completed, each team selected a team pilot and airplanes to compete against the other teams for a distance flight contest. Team #1 threw first and their plane flew nearly half way across the gym, “rolling” to a stop on the half way mark (yes, the roll-out counts in the distance): quite impressive and hard to beat. Team #2 had a shorter flight but not bad. The Team #3 (Terry’s Team Wild Mama with ball cap clad captain) launched a plane that FLEW over ¾ of the gym and rolled out just before hitting the far wall! Whoa!!!! Cheers rang out from team members and others mouths dropped to the ground. Beat that!!! Teams #4 - #8 all flew varying distances but nothing even close to either Team #1 or Team #3, so Team #3 claimed victory in the first airplane contest and a coupon per team member. After a quick homemade chocolate chip cookie break, it was back to the remainder of the film. The after film activities were building on what was learned in the film about the race route and in anticipation of the route to come. The girls had US maps and had to write the names of the state on the map of each place where the 1929 race landed and on another map where the 2011 race will land. Each team member got a coupon for each correct map. Finally, there was a brief exercise on the phonetic alphabet where each girl was given the alphabet and had to write her name in the phonetic alphabet, reciting their names when called. India-November-Gulf-Echo-Romeo started off. 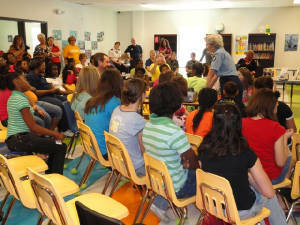 As the girls stood and read their names one by one, they were dismissed for pizza and soda. The final coupon was earned by filling out the daily evaluation: What did you learn? And other questions were posed to see the results of the day. The buses arrived and girls filed out of the center with pockets full of reward candy and a balsa airplane to go home and launch into new adventures. 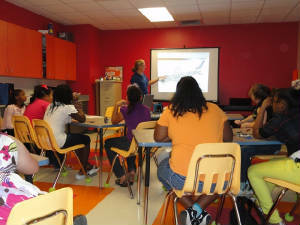 Inger will be working with her counselors to keep the individual centers alive in training the girls in other aspects of aviation in anticipation of the next group meeting at the airport, Brookley Field, Downtown Mobile, on February 19th. After a long day, Vern and I launched out in Wild Mama at dusk. The air was still crisp and cool; the sun was just dropping below the horizon and we had a tailwind! 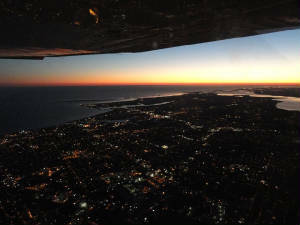 As we scooted along at 170 kts across the darkened emerald cost we watched the flickering lights below in the city backlit by the sunset and marveled as we looked forward to see the city lights meet the stars. This is why we fly. 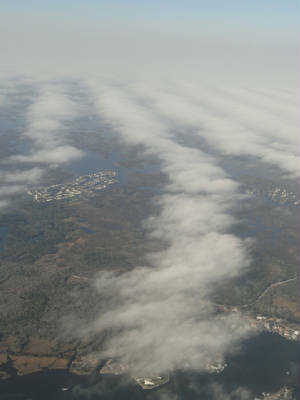 FEBRUARY 2011: Departure out of LaBelle was beautiful VFR weather but we had to file to Mobile because of low IFR all the way enroute from Orlando north. The forecast was to clear by our arrival time but we wanted to be sure we made it. As we approached BKV, we saw it in the clear, which is unusual, but the inland areas were completely socked in with low, thick fog. We were scooting along 4000' and 155 kts and happy. 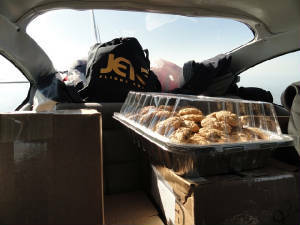 We were loaded to the gills with all sorts of stuff for the Mobile girls: shirts, appliques, charts, books, magazines and, of course, cookies. As we proceeded northward the coastline started to disappear. There was scattered fog at first then fog logs that finally joined together into the fluffy white blanket across the ground. We remained in clear blue skies but could see nothing of the ground below. We had gotten a late start so by the time we got to the MOA's they were already hot and we got diverted to Marianna then west on V198. Our speed dropped to 140 kts but we were in clear skies and the ground below became visible giving us a clear shot into Brookley Field. We hit the ground running, meeting Inger and delivering our goods for the kids then heading out for some more organizing. 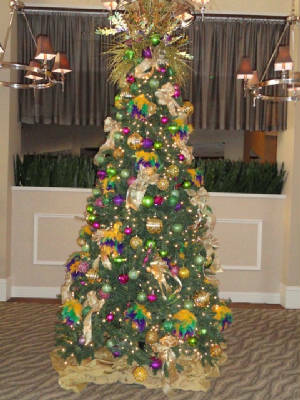 This is Mardi Gras week and the streets were hopping with partiers waiting for the big parade tomorrow night. We settled in for dinner at Wenzels and an early evening. More work tomorrow and the big day for the kids Saturday. The fog Saturday morning was the worst so far. By 0600 we could barely see the parking garage across the street, let alone the Renaissance Plaza down the street. But we were already anticipating this problem and Inger backed up the time schedule by a bit. We got to the airport by 0830 to meet racer, Mae Marquet, who flew in yesterday from Lafayette, LA to help with the girls and to tour the Airbus. 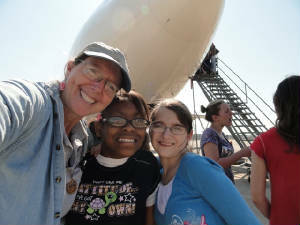 This was a special day: most of the girls have never been to an airport and very few have been on an airplane EVER; so this was going to be a treat. It is hard to say what was the “star” of the show today; but everything depended on the weather. 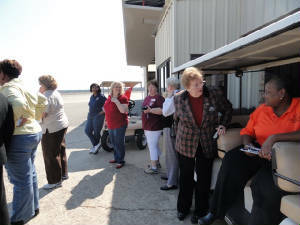 By 0930 the girls had arrived at the airport and were ushered into the lounge at the Downtown Air Center at Brookley Field. There was no sign of the Airbus so we had some filler time. One of the local line men came over and explained to the girls the function of an FBO and what he does as a line man. 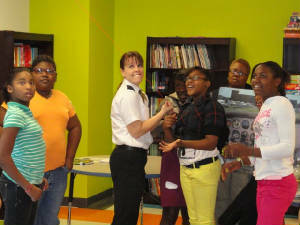 Then Captain Kathy, another fairly local Airbus Captain, spoke to the girls about the Airbus and the opportunities at UPS – they learned that they could go to college FREE if they work for UPS. That is certainly an opportunity worth investigating. Several other great opportunities presented while we were waiting out the weather: Tom, the local squadron commander of the Civil Air Patrol, and his other leaders, spoke with the girls about CAP and Ryan, a local Citation pilot, opened his Citation so the girls could get a look at a small jet, giving them exposure to small, medium and jumbo sized planes today. 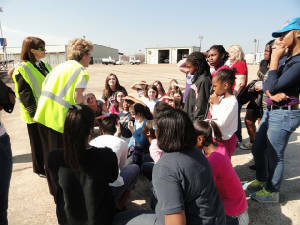 While we were out on the ramp with the Citation, the Airbus taxied over to UPS and Captain, Terri Donner arrived to tell the girls about the tour of the Airbus A300. 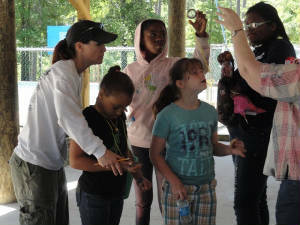 The gaggle of girls – both kids and adults – followed Terri over for the tour. The cargo had been off-loaded and the empty behemoth stood in front of us all. Whoa! Terri took us all on the inside tour while Kathy showed the cool stuff on the outside. We filed up the stairs and into the cargo hold – whoa again! I could picture the rows of passenger seats neatly installed in the plane but it seems so much larger when it is all empty. The A300 is about the size of the Boeing 767 wide-bodies jet. The cargo version is filled with track rollers, instead of seats, to accommodate the cargo containers, some of which have rounded tops to fit the contour of the plane. We toured the jump seat area and the cockpit. I thought Wild Mama had lots of buttons and toys but this was way cool – you could see that both the pilot and co-pilot had plenty of buttons to play with on their own! Our inside tour was over all too fast and we headed outside to see the jet engines, the landing gear and the wing areas and learn about the turbines, retractable gear and fueling. 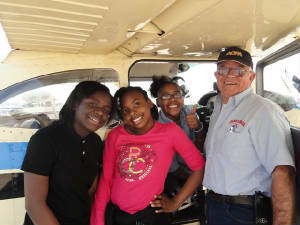 When the tours were over, the girls started back to the FBO to meet up with their pilots for the Young Eagles rides. 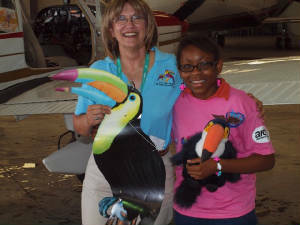 Air Race Classic was fortunate to be able to partner with EAA and the Young Eagle program to give the girls a real taste for the adventure of flying. 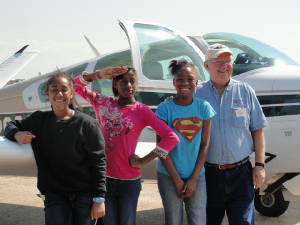 A flock of 8 planes, including Wild Mama, took the girls on a 30 minute scenic flight over the Mobile area. Some of the girls got to fly but all enjoyed a window seat to a new world. As the first plane load arrived back at the FBO in Wild Mama, Terry was there to greet them: smiles and giddy with excitement ….. that would be both Terry and the girls! A news reporter wanted to get their first impression of flight. 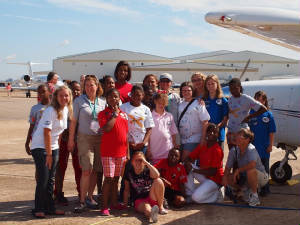 None of these girls had ever been on a plane so the bird’s-eye view of their world was a real life changing experience. Words like “awesome” “cool” and “this was the best day of my life” were common expressions. Many of the girls said they were nervous but the nerves quickly subsided as they lifted into the air. They saw some sights of familiar places that did not look the same to them at all. Through the light haze they over flew the Gulf and the neighborhoods surrounding the airport. They could see the tall Renaissance Plaza from the air – it looked so small compared to the way it normally looked. The world was a new and exciting place from 100’! When all the rides were over, the girls got certificates, log books pizza and their pilots got lots of thank yous and hugs. Through it all, the adults a/k/a “big kids” could only sit back and watch their charges with envy. Once the kids were inside chomping away on pizza, it was the big kids turn. All of the counselors got a ride of their own to see what the girls were all happy about. 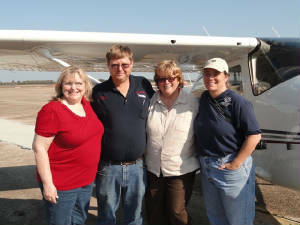 For them, it was their first ride in a general aviation airplane; and one lady came off Wild Mama saying “I feel a career change coming on. 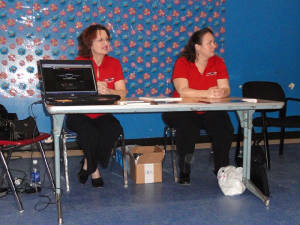 That was amazing!” Many ladies inquired about taking lessons on their own – yes: it is NEVER too late to learn! 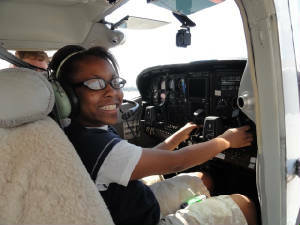 In all we flew 53 girls and 9 adults and opened many eyes to opportunities and possibilities. There is no limit to what these girls can do. Air Race Classic and the Boys and Girls Club of Mobile extend many thanks to those who helped to make today and awesome experience for many ladies: EAA, UPS, Downtown Air Center and the BFM tower guys – you were all AWESOME!!!!! March 2011 - Other than Sunshine Derby day where LaBelle was shrouded in fog, the past week in the Fort Myers area has been beautiful: cool, clear mornings and great visibility. 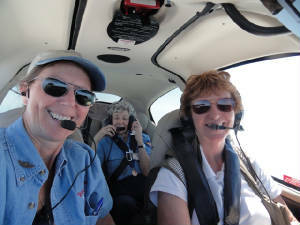 We were anticipating a clear launch Friday morning as Ellen and I departed in her Cirrus to North Palm Beach County Airport to pick up our special passenger, Bee Haydu, one of the 200 or so remaining W.A.S.P.'s. Clarity was not to be as Fort Myers was fogged in, delaying our departure by about 1/2 hour and giving Ellen the chance to launch out in minimums. She powered up the Cirrus and make a quick climb, breaking out at 400' to that beautiful, blue Florida sky. 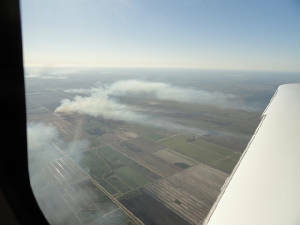 We went high above the haze layer (yes, the beautiful, blue Florida sky almost always includes haze) and over the sugar cane fires to the east for a quick flight into North County where Bee was awaiting our arrival. 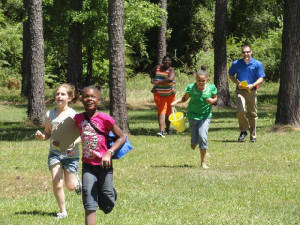 This is a special weekend for the kids in Mobile: ARC and the Boys and Girls Club are hosting career day as part of the Adopt-a-Racer program. 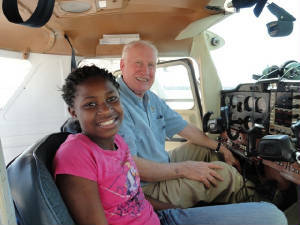 The girls will have the opportunity to learn about various aviation careers - both flying and non-flying - and meet some ladies who serve us in the aviation industry. Ellen, Bee and I launched out from North County on schedule. 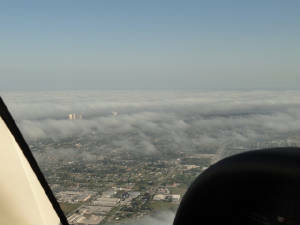 The ground fog dissipated and the tailwind aloft left us cruising about 180 kts over the ground. It was a short 3 hours to go. It was a pleasure to have Bee along with us and we kept up a lively conversation over the rather annoying interruptions of ATC giving us directions and talking to other pilots. Having to talk to ATC can be a problem when the conversation in the cockpit is so good! 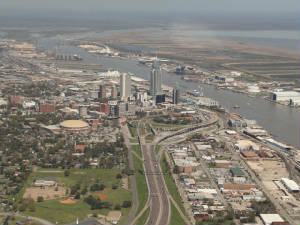 We landed at Mobile Downtown and hit the ground running. We headed off to see Inger and get directions to the Boys & Girls Club Camp to start work on next months' activities - TOP SECRET at this point! The camp is a beautiful setting and Bee got some rest under the shade trees for a bit before heading off to dinner at Wentzel's. We had pre-arranged our dinner meeting so we could fit everything in this short trip. 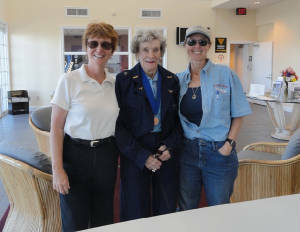 Bee is a rock star in aviation circles and everywhere we went, folks wanted to meet her and take pictures. Ellen and I were thrilled to be there with her. We met Robin Tillery from TCM and Inger for dinner and we laughed and told stories for the better part of 2 hours. Exhausted and knowing we had a long day ahead of us, we headed back to the hotel for some much needed rest for all of us. Saturday morning found Linda Wehrle knocking on my door at 0800 to fetch me for the ride out to the Sonny Callahan Club to help finish the set up for the career day event. We have assembled a varied and impressive group of professional women to talk about their careers and we were looking forward to the presentations as much as the girls. As the girls started arriving, I noticed the collages on the walls and some that girls brought with them. From the "all call" on Facebook, Inger got a TON of magazines that were distributed to the Boys & Girls Club centers. 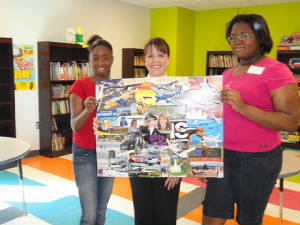 The girls got to read the magazines and make collages on various aspects of aviation. The collages were all quite good but the one that caught my eye was the "Girls With Wings" collage featuring Lynda Meeks. 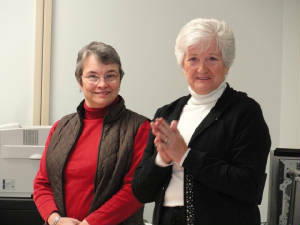 Unbeknownst to the young ladies who made the collage, Lynda was one of the featured presenters. You can imagine the look on their faces when they got to meet the lady about whom they had recently read and pictured. 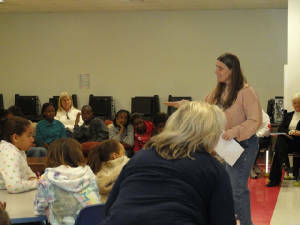 Career Day - "No Limits" started off with a presentation by Bernice "Bee" Falk Haydu, 44-7 W.A.S.P. 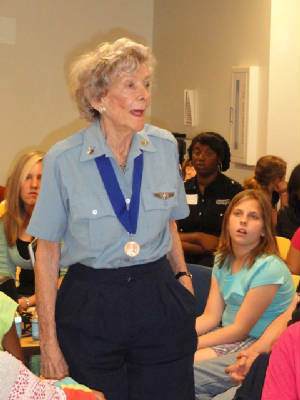 Bee captivated the young (and older) audience with her slide show and talk about her flying career and in particular her days as a W.A.S.P. She had pictures from the 1940's training days at Sweetwater, TX and told of the weather extremes that they had to face as trainees; the challenges of learning to fly the military way; about the rewarding experience of serving her country and about the Congressional Gold Medal Award. The girls were full of questions including "Did you ever have to kill anyone?" and "Did you ever get a scorpion or a rattlesnake in your bunk?" But they also wanted to know if she ever got lost flying, what to do if you run out of fuel and boot camp life. Bee concluded with a mention of her book, "Letters Home". 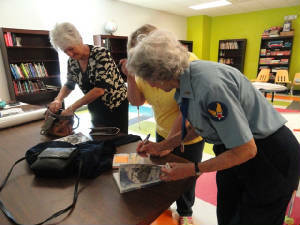 Her presentation was greeted with a hearty round of applause, requests for pictures, book signings and many words of thanks both for her appearance for the kids and for her service to our country. 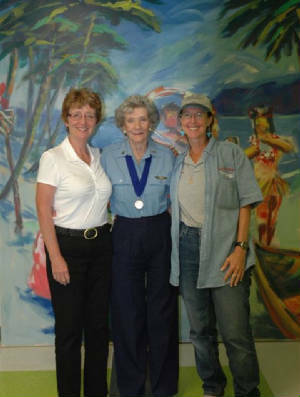 From the past we moved right into the present with US Coast Guard officer and pilot, Julie Padgett. 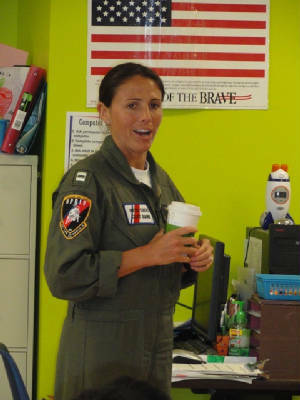 Julie, who just came off a 0300 search and rescue call, talked to the girls about her career in the US Coast Guard. 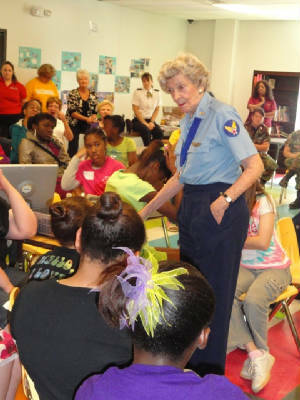 She spoke of the education and training required and the different fields available to the girls depending on whether or not they want to go to college - there is something for everyone with the Coast Guard. 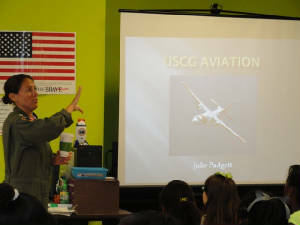 Julie showed some slides of the different aircraft that are used in the Coast Guard and talked about the missions - search and rescue, assisting with border patrol and anti-drug smuggling operations, homeland security and missions like the recent oil spill in the Gulf. 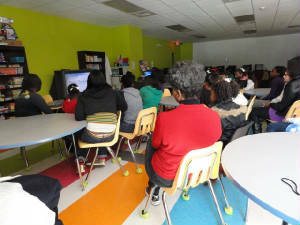 The girls were particularly interested in hearing about the boot camp and the 8 weeks of training to get their careers started. Julie finished with a lively question and answer session and departed for her home to rest up after her all night mission. 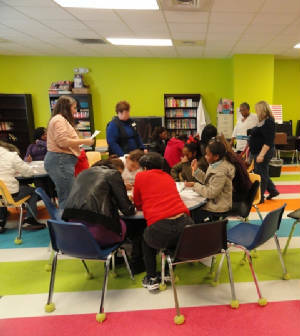 After a brief break, the girls divided into 4 rotating groups for more activities and career learning. 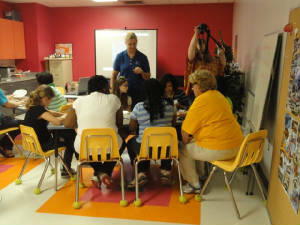 The first 2 groups stayed in the big room with Lynda Meeks, Founder of Girls With Wings. Lynda does an interactive hour long program teaching girls about aviation but also about life skills: never look at the big picture and become overwhelmed. Always break it down into smaller, easy to manage tasks and build on them to accomplish the bigger goal. Lynda craftily takes the kids through everything they need to know to fly, breaking it into the smaller tasks to prove to the girls that even something seemingly so complex is really easy and that they can all learn to do anything they can dream to do. 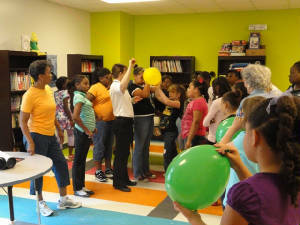 Lynda finishes with an airplane balloon launch showing the girls that even the sky is not the limit! Group 3 started with Lisa Brunegraff, Senior Engineering Specialist for Airbus. Lisa is an airplane interior designer and got the girls thinking about the things that are necessary to design and construct an aircraft, pointing out that an aircraft needs an interior just like your home. The girls were amazed at how many similarities there were between the two. Lisa talked about the Airbus A380 and how it dwarfs the A300 that they girls had toured just last month. The engine alone is over 12' tall! Then Lisa explained how it takes four years to construct an A380 but showed a video of the project - start to finish - in only 4 minutes. WOW! Talk about fast forwarding a project. 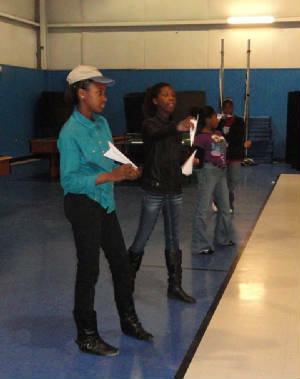 Just as Lisa designs airplanes, the girls got to try their hand at constructing a styrofoam plane, complete with test flights for distance and accuracy. I took a bit of a pounding on the accuracy challenge but it was all in good fun. 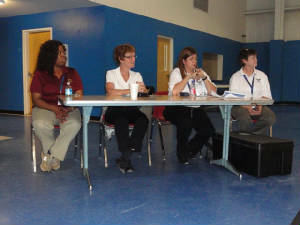 The final group started in the round-table discussion of non-flying aviation careers featuring Renee Blackmon, UPS Ground Support Supervisor; Ellen Herr, retired Air Traffic Controller; Valerie Gray, Communications Specialist and Kimberly Doerner, Director of Human Resources, GAT Ground Support; Robin Tillery, Marketing & Communications and Theresa Ballard, Aviation Technology & Customer Service, Teledyne Continental Motors; Lt. Col. Jack Bentley and Cadets, Helen Clark and Jessica Howe, Civil Air Patrol. Each representative gave an informative overview of her company and profession and they all fielded questions from the girls and had time for up-close-and-personal chats about available opportunities, education and "a day in the life of...". 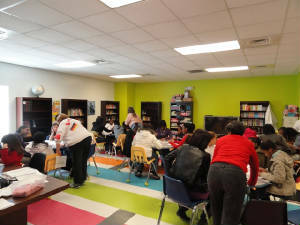 The whole 3 hour long program ended with pizza and a meet and mingle where the girls could inquire more on their own and meet their future employers and co-workers. It is exciting to see how the girls are blossoming and feeling encouraged for a future full of hope and opportunity. 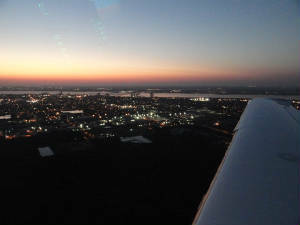 But for our Florida crew, daylight was burning and we had lots of flying to do before our day was over. Bee, Ellen and I acted as a well oiled machine to make our way back to the airport, taking care of all of the necessities for fuel and food along the way. We boarded our winged steed and set off to the east. Ellen filed IFR again to get through the military zones and restricted areas and short cut our way across the panhandle of Florida. With everything "cold" late on a Saturday afternoon, we made quick work of the trip back to North County Airport, even with a slight headwind. With Bee safely back at home, Ellen and I finished our flight to the west and into a spectacular sunset and the rising of the "supermoon". It was a wonderful and successful weekend; and as Bee said: "I think I got out of it more than the kids." It was a weekend well spent. April 2011: Wild Mama blasted off this morning to beautiful, clear blue skies enroute to our last group meeting the Mobile Girls Club girls before the race. They will have one ,ore group meeting before June, but I will not be making that last meeting as the 99s Section Meeting in Lafayette, LA is the same date. In no time at all we were over top of Lakeland looking down and recalling the damages of just 2 short weeks ago. As I looked over to the camp ground area where Wild Mama got hit, I could still see the twin that was parked next to us that sustained rudder damage, and the two planes that ended one on top of the other. None have moved. Those are the (I am sure) unreported or uncounted in the damage toll, as was Wild Mama. They really only loomed at the flight line and the bulk of the damage and I believe all the other planes that received minor damage were simply forgotten. Fortunately, however, my insurance agent, Tommy from Falcon Insurance Agency, and Chartis remembered me and we have already settled the claim for Wild Mama. Her new ailerons have already been ordered and will be installed as soon as she returns from this trip. The remainder of the damage will be repaired after the race as she will be down for three months by the time the wings are removed and repaired and she gets her new paint job. I always file to cut across all of the MOA's at the Gulf. If they are cold, I win; if not, then we get rerouted over Marianna the long way. So far, so good today: with a little jog toward CLRRK to avoid Tyndall E MOA, it looms like we can scoot across the remainder of the restricted areas. Since we are sporting the customary headwind, this will help keep our trip to only 3.5 hours. The car was there and waiting for me when I landed and I hit the ground running. Ther was lots to do and little time to do it to be ready for the girls on Saturday. The weather forecast for Friday was severe thunderstorms and hail. That was supposed to be set up day but we thought better of it. I put all of the stations together in my room at the Holiday Inn and delivered everything to the camp Friday for an early Saturday morning set up. Each station was separated out in a neat pile so none of the strings, etc. would tangle. That lasted about 30 seconds when we tried to load everything into the air with 20 kt winds. So much for organization. We got everything unloaded safely at the camp and untangled the mess from the winds so it would be easy to set up Saturday morning. With a severe thunderstorm and tornado alert for the remainder of the day, we did not want to take the chance of setting up the whole thing only to have it blow away in the dead of night. Around 10 pm it happened: the tornado warning siren sounded. It was going to be a long night. The night passed without incident in spite of the siren sounding once again around 11:30 pm and I awakened to an absolutely beautiful day. Inger and I scurried out to the camp to work on set up by 6:30 am. We were later joined by Ingrid and Linda Keller and got the remainder of everything hidden just as the first van load of girls arrived at the camp. It was going to be a good day. We had 4 different activities planned for the day. First we had a weather station. 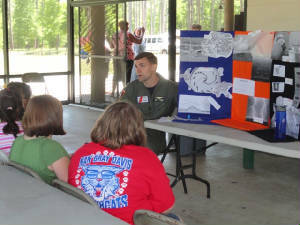 The local Coast Guard sent a volunteer, LTTG Greg Quillin, who set up a display to talk about aviation weather and time. 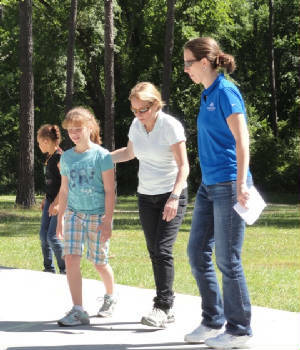 Second, Keri Wright, ARC VP, and her crew came for an airport demonstration where the girls were "airplanes" and had to "fly" in to the airport, following the instructions of ATC. 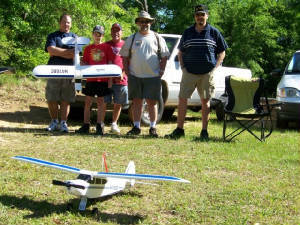 Next, the Azalea City Model Airplane Club arrived with 7 brand new RC airplanes for the clubs to keep. 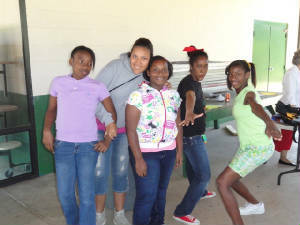 They were to teach the girls how to fly the RC planes and do a demonstration with a helicopter. 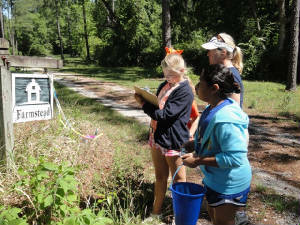 Last was the navigation scavenger hunt where teams of girls had to use the compass to navigate their way through the scavenger hunt, collecting items and clues along the way. 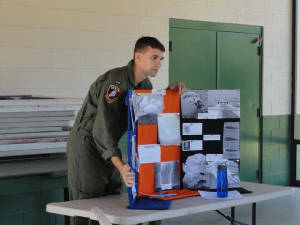 They also had to answer a series of questions based on all of the aviation knowledge they have been accumulating during the past several months. The winner was the team to answer the most questions correctly. Inger quickly introduced all of the guests and divided the girls into 3 groups for the beginning of the day. 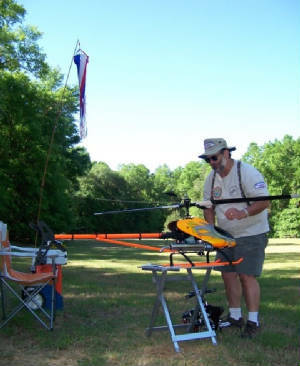 The winds were beginning to pick up a bit by then which made for a very pleasant day for all but the ones flying the RC planes. 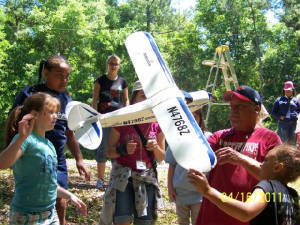 The planes are made of Styrofoam and are very light. With the trees in the camp area, the flyers had to get the planes high in the air where the wind played havoc with navigation. 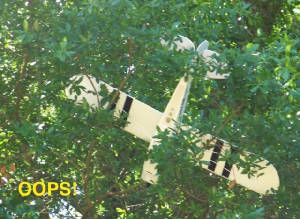 We ended with a plane in the trees - although it was recovered after much branch pulling and tugging - and another that caught a great thermal and took off on its own, never to be seen again. Someone will have a bonus find along Shelton Beach Rd! 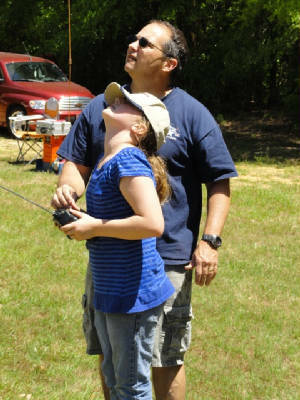 It was fun to watch the concentration o the girls flying the planes. all eyes tried to follow as they flew higher and did aerobatic loops. The Boys and Girls Club is keeping the planes and they will be working with the RC Club in the future after the race leaves to keep the girls interested in aviation. 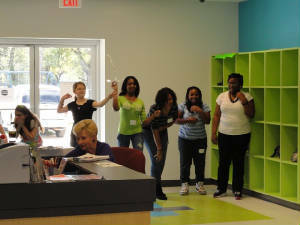 Keri and Siobhan quickly got to work with the "airplanes" girls. Each girl got her "tail number being a combination of her birthday and initials. They were all called by the tail numbers as they were shown how to enter a pattern, taxi down the taxiways and land on the chalked runway. 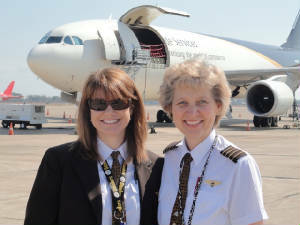 How fun to watch as Keri and Siobhan tamed the chaos of airplanes into a neat little package of controlled chaos! 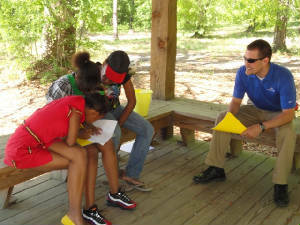 Our Coast Guard weather guy Greg had the girls mesmerized with his weather talk. It was nice to have a small group - only 6-8 girls and he and Keri split a group - so they could ask questions and get really involved in the discussion. He talked about Zulu time, about turbulence and all the different ways that the weather impacts aviation. 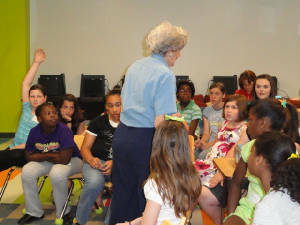 Many of the girls asked questions and took a real interest in the weather discussion. The scavenger hunt took the most time for girls to complete. 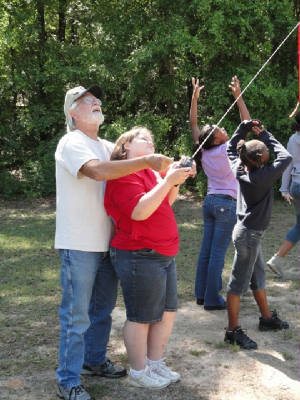 They all had adult team leaders to help keep them on track. Racer, Linda Keller, Andrew (another of Keri's associates), Ingrid and LA each took a team and set off. The first round of hunting went slowly with the girls getting hung up on locating the eggs buried in the sand pile and the balloons in the pond that the wind pushed under the dock. 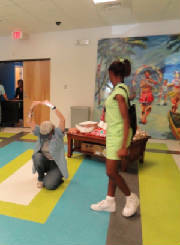 But through the popping of balloons and hunting for the hidden clues, they managed their way through the entire course. 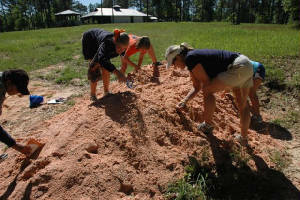 Ingrid and her team was the first to dig through the sand pile and they made sure that the other teams to follow had quite a chore, burying the other eggs deep in the pile, some never to be found. Linda expertly guided her group through the pink course, hinting at some of the more difficult answers to get them a high place in the final standings. Andrew, in particular, was very encouraging to his girls. He had them running (or vise versa) to the next set of clues; he cheered them on and provided much encouragement when they had 3 minutes to fill out the map of the US with all of the states. His efforts paid off with a first place win for his yellow #3 team! With all of the girls getting prizes for the day, it was time for us volunteers to head out. Inger and the girls remained at the camp for a sleep-over, but we needed the comfort of our own beds! 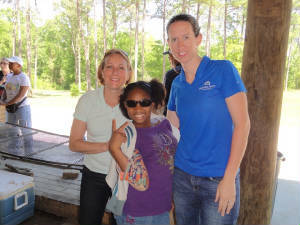 Many thanks to the host of volunteers who came out today to help including the Azalea City Model Airplane Club, Keri Wright, Siobham M'Olgan, Andrew Etheridge, USCG LTTG Greg Quillin, and the usual crew of Boys and Girls Club counselors, Ingrid, Inger and LA. Without everyone’s' help, today would not have been such a success. May 2011: With the racers busy with racing preparation, it was time for the girls to start getting ready too. This month there will not be a group event as each of the girls is busy getting her racing team shirt ready for the big day: when the racers make the final fly-by in June at Mobile Downtown Airport. Inger will be sending email information to the race teams and the girls so everyone can start "bonding" as a team. 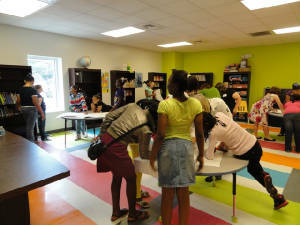 Our next meeting with the Girls Club will be at the terminus on June 23rd or June 24th. OK, team - time to cheer on your Team Wild Mama!!!!!! June 2011 - ARC Terminus Meeting: Finally the big day has arrived. The girls have decorated their shirts with race team numbers, all sorts of blings and patches, paint and doo -dats of all sorts. Team Wild Mama came screaming across the final timing line in Mobile after a shortened Air Race Classic but we were thrilled to have completed the race as usual. We were greeted by a couple dozen girls cheering for us. It was so great to be home and fantastic to see all of the girls. As other racers filtered in, each was greeted by their own young "teammates". Many of the racers brought gifts for the girls and the meetings were full of hugs and questions. Saturday found all of the girls with their families and the racers at the USS Alabama Battleship and Air Museum. This was the grand graduation and awards ceremony for the girls who had participated in the program for the last 6 months. 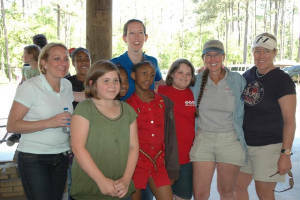 There were awards for perfect attendance, best communications with racers and for girl power! Air Race Classic and Terry each got a special thank you drawing. The afternoon was quite magical and marked the end of the official Air Race Classic Adopt-a-Racer Program. 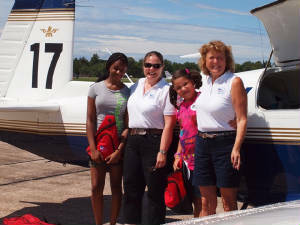 But this is not the end of the story: the girls and their families, and others who did not get to participate made such a clamoring to continue that the Girls "No Limits" Aviation Program was born to continue the efforts started by the Air Race Classic. Congratulations to Inger Anderson and the myriad volunteers for launching such a successful program and congratulations and best of luck to the young ladies who are just getting ready to embark on a life of "no limits". Bragging Rights - Special bragging rights go to INGER ANDERSON and the Boys & Girls Club of South Alabama. 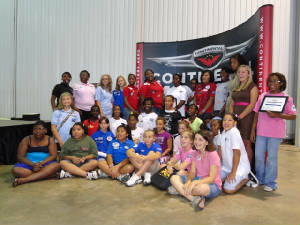 Boys & Girls Clubs of America is pleased to notify us that Boys & Girls Clubs of South Alabama, Sonny Callahan Boys & Girls Club is a 2012 Honor Award winner for our "No Limits" Girls Aviation Program entry in the Education and Career Development category. 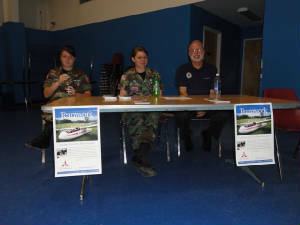 This was th aviation program that was created in conjunction with the 2011 Air Race Classic. 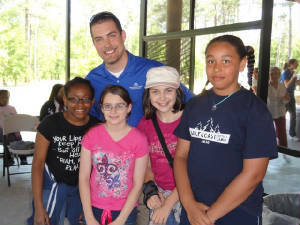 Only one first place award is given annually to a Boys & Girls Club organization in each of the five core areas. Applications are received from organizations around the world; from traditional, military, and Native American clubs. This national award is the first for BGCSA and will be presented on stage at the finale dinner at the Annual National Conference May 2-4, in San Diego.